Marathon bombing suspect Dzhokhar Tsarnaev was seen on camera Dec. 18 returning to federal prison after an appearance in court. 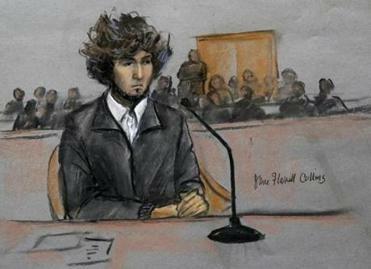 The upcoming trial of alleged Boston Marathon bomber Dzhokhar Tsarnaev, scheduled to begin Monday, should be moved outside Massachusetts or, at the least, postponed for a substantial period of time if he is to receive a fair trial. The Tsarnaev case is unique in modern Massachusetts history, and this must be recognized at every step of the proceedings. Nearly every citizen of the Commonwealth surely has thought that “there but for the grace of God go I.” The victims of the bombing extend well beyond the three spectators killed and 264 that sought hospital attention for serious, often life-changing injuries. Tens of thousands of residents in the cities and towns surrounding the bombing locale were subject to an unprecedented governmental “shelter-in-place” order to remain in their homes during the five days that para-military police squads, armed with weapons of war, hunted down the defendant and his older brother, who was killed in the shootout in which the defendant was seriously wounded. O’Toole has flouted the teachings of two highly relevant precedents, the Timothy McVeigh Oklahoma City bombing case and the prosecution of admitted serial killer Gary Lee Sampson here at home. US Federal Judge George O’Toole Jr. is presiding over the trial of Dzhokhar Tsarnaev. The court is considering a last-minute request by the defense to postpone next week’s scheduled jury selections and relocate the trial. The Oklahoma City bombing prosecution furnishes an instructive precedent that strongly suggests that Tsarnaev should not be tried in Massachusetts. It is a precedent that O’Toole has recklessly misread and misrepresented in denying a venue change. In 1996, Judge Richard P. Matsch was designated to preside over the trial of McVeigh, the Oklahoma City bomber responsible for detonating a truck bomb in front of a federal building that killed over 150 and injured several hundreds more, including young children at a day care center. Matsch concluded that a fair trial could not be held in Oklahoma. Despite what potential jurors might claim during jury selection, Matsch knew that any claims of impartiality and fairness would likely be overcome by the enormous prejudice surrounding the case and the public pressure to deliver a guilty verdict. He transferred the case to Colorado. Oddly, O’Toole mentioned the McVeigh case in a single footnote of his order denying a change of venue. While grudgingly conceding that “there may be some similarities,” he concluded that McVeigh “is not pertinent” because “the main federal courthouse itself had suffered physical damage in the explosion . . . and both parties agreed the case should not be tried in the district where the crime occurred.” In fact, the reason for the change of venue was not because of the courthouse damage; trial had been slated to begin in an adjacent town. The reason for the McVeigh change of venue was that an entire community — indeed state — had felt uniquely menaced by the crime. In his order granting McVeigh a change of venue, Matsch cited the “immeasurable effects on the hearts and minds of the people of Oklahoma from the blast and its consequences,” and concluded that “the effects of the explosion on that community are so profound and pervasive that no detailed discussion of the evidence is necessary.” He listed a number of factors, many of which presaged the feelings that would arise in Boston nearly two decades later: “The tragic sense is heightened by the deaths of infants and very young children in the day care center” in the federal building. Here in Boston, the searing image of 8-year-old Martin Richard, who was killed in the Marathon bombing, surely raises the same problem for a fair trial — something that seems to have eluded both O’Toole and US Attorney Carmen Ortiz’s office, which insists on carrying out the prosecution in Massachusetts. Worse yet is O’Toole’s insistence on pushing Tsarnaev to trial this Monday. The defense counsel has asked the court to delay the trial until September. Postponement would be the least remedy for ameliorating saturation publicity — a delay to give time for tempers to cool and memories to begin to fade. If trial begins this month, the subsequent penalty phase could well coincide with the second anniversary of the bombing. 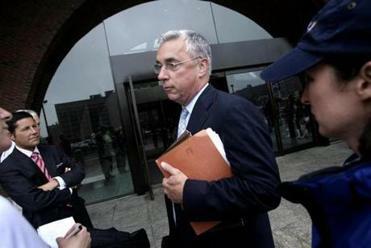 O’Toole clings to this trial date, despite the defense lawyers’ well-documented plea for more preparation time for perhaps the most complex case to be tried in Boston’s federal court in modern times. Adequate preparation would vindicate another element of due process of law. The investigation of the Marathon bombing was one of the most intense criminal investigations in living memory. A veritable mountain of documents was turned over to the defense, the latest batch (which included nearly 10,000 numbered pages) was delivered in mid-December. There is no way that the defense team could possibly be prepared for a January 5 trial date. O’Toole ignores yet another precedent, this one right in his own back yard: US District Judge Mark Wolf’s decision to postpone the sentencing trial of Gary Lee Sampson. Sampson, convicted of the carjack killings of three men, had been condemned to death in 2003, but Wolf threw out the death verdict when he learned that one juror had failed to honestly answer questions during jury selection. Wolf has put the sentencing trial off until September, to afford defense counsel time to properly prepare. Tsarnaev is an infinitely more complex case, and it touches the entire Massachusetts community far more deeply than does Sampson. Wolf decided to postpone the sentencing trial of Sampson, out of an abundance of caution, erring on the side of a fair trial that is supposed to be the norm especially when the death penalty hangs in the balance. O’Toole instead is erring on the side of expedition. Efficiency can be overrated when justice, and our own adherence to civilized and constitutional norms, hang in the balance.